State sues door-to-door solicitation company. 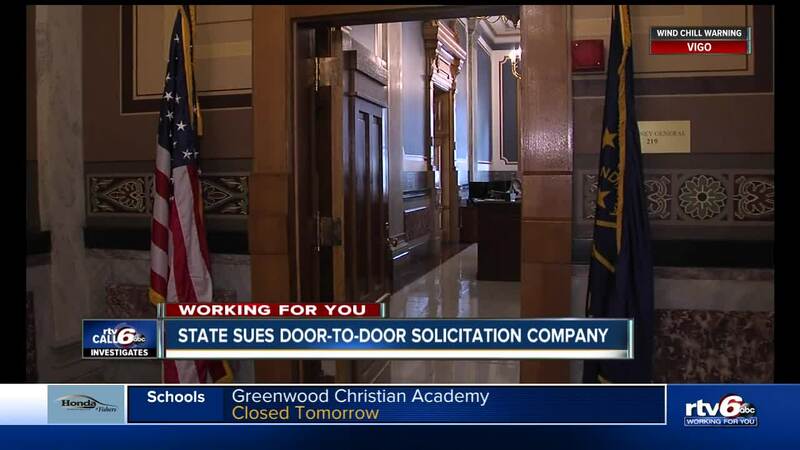 INDIANAPOLIS — The Indiana Attorney General’s office has filed a lawsuit against a LaPorte County door-to-door solicitation company, accusing them of misleading consumers about their right to cancel and get a refund. The state filed a complaint on January 18 in LaPorte County Circuit/Superior Court against Entrepreneurs Sales LLC, alleging they violated the Indiana Deceptive Consumer Sales Act and the Indiana Home Solicitation Sales Act. The Attorney General alleges in many instances, the consumers never received the products they ordered. By law, Indiana consumers have three days to cancel a contract signed during a door-to-door transaction and get a full refund. Entrepreneurs Sales solicited to sell books and magazine subscriptions to Indiana consumers in June 2015, October 2016 and June 2018, including in Zionsville without the required solicitors permit, the lawsuit read. Of the 129 consumer transactions in Indiana, 101 had either missing or incorrect information about the date in which the customer could cancel. Entrepreneurs Sales LLC is accused of using misleading and inaccurate receipt documents and failing to provide consumers with accurate, meaningful information regarding their legal right to cancel the sale and receive a refund. The lawsuit says this is considered unfair, abusive, and deceptive, and constitute violations of Indiana’s Deceptive Consumer Sales Act and Home Solicitation Sales Act. The “Notice of Cancellation” provided to consumers was not in at least 10 point boldface type as required by law, read the complaint. Betsy DeNardi, director of consumer protection for the Indiana Attorney General’s office, said they hope to send a message to other companies as well. “Part of the reason we file these lawsuits is to let companies know we are making sure they are enforcing and complying with Indiana's laws,” said DeNardi. “If you're going to send your sales people out door to door to solicit individuals, you need to follow the law when it comes to home solicitations and make sure you're including information on those forms that you're supposed to include." Call 6 Investigates contacted Entrepreneurs Sales LLC via email and phone, but the phone number was no longer in service and no one has responded to our email. Regarding any door-to-door offers, you can protect yourself by not answering the door.